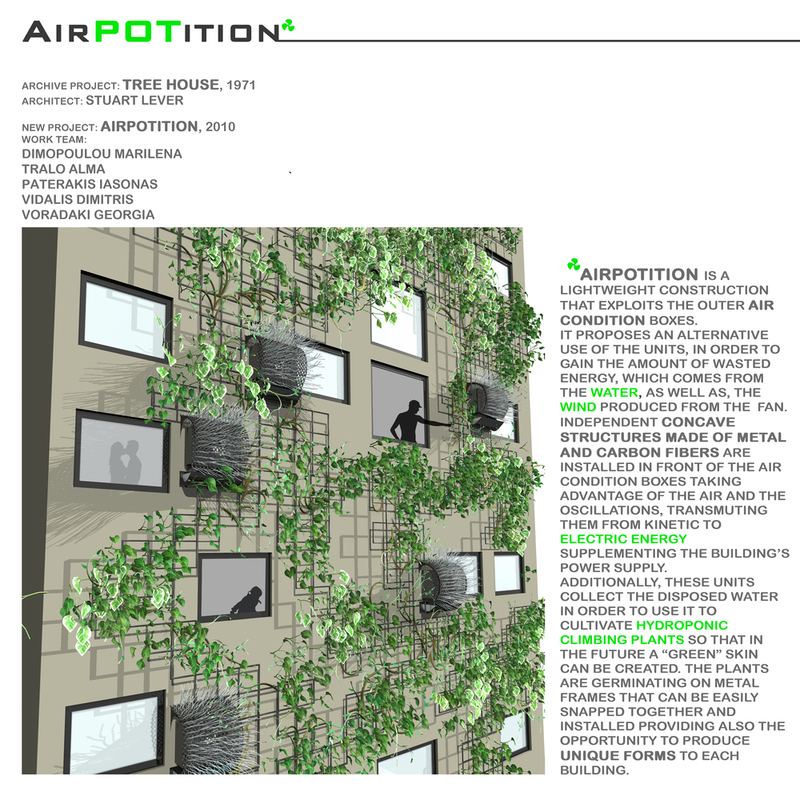 AirPOTition is an unconventional structure which has a double benefit to humans (energy and aesthetic benefits); it suggests a way of saving electric energy, water and money, and at the same time, offers a friendly and healthier environment to the habitants and protects the planet. Our objective is the gradual development of green cores in the cities that could offer a friendly natural place for people to live in. Nowadays, the contemporary lifestyle in every modern metropolis enforces people in an unhealthy way of living. The immoderate waste of natural resources (oil, water) and the use of them in the industrial procedures led to different kinds of pollution and climatic changes. As a result, we waste more energy in order to protect ourselves from these changes, as for example air-conditioning. External airconditioning units dominate the most urban building facades, leading to a deterioration of the local image. Areas with invaluable local culture as long as other areas of the planet, suffer from this phenomenon which also leads to microclimate changes. 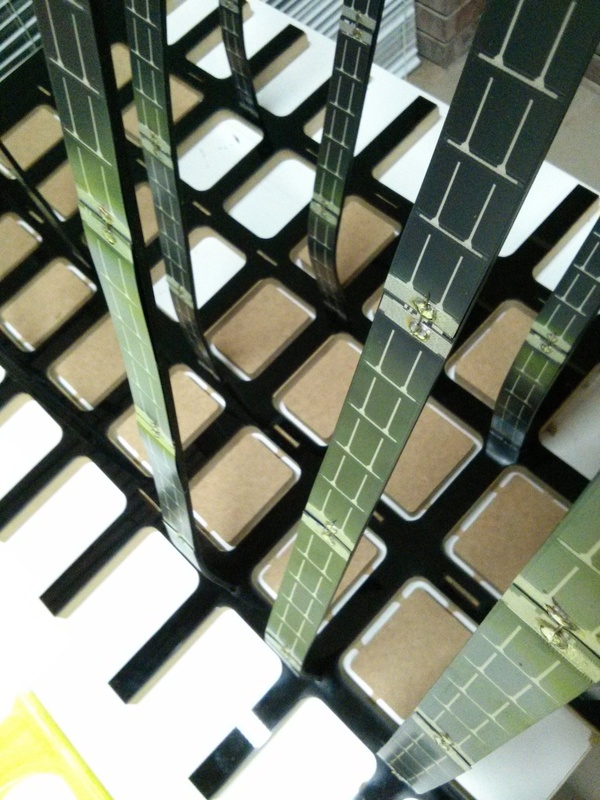 AirPOTition is a lightweight addon construction that exploits the outer air condition boxes. It is based on the air-conditioning system that it is installed on the façade of almost every single building in contemporary cities. Only in Greece, there are more than 7.000.000 installed air-conditions and about 350.000 units are added annually. Every 9,000BTU A/C unit produces 10L/day distilled water, while a public building produces 40L/100m². Moreover, a 9,000 BTU A/C unit produces 800gr CO2 and a 12,000BTU A/C unit 1600gr CO2. All these useless outputs, in addition to the produced wind and the existing solar energy, were the spark of our concept. 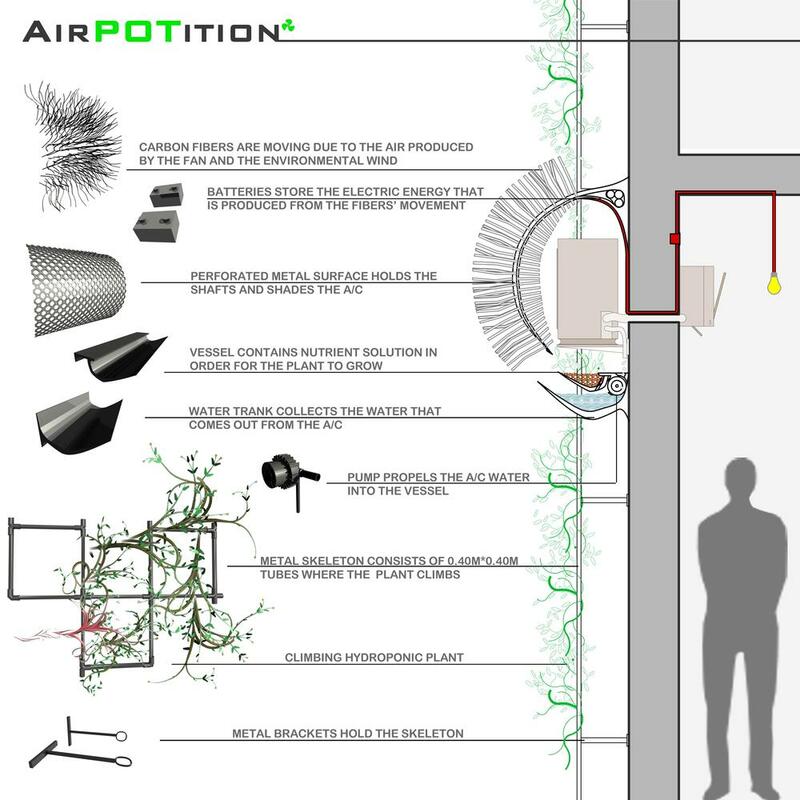 AirPOTition proposes an alternative use of the units, in order to gain the amount of wasted energy, which comes from the wind produced from the fan and the solar energy. More specifically, it converts the kinetic energy that is being produced by the air, into electric energy and it collects solar energy, by using micro-photovoltaic panels, and converts it into electrical energy. The electrical energy produced by the wind and the sun are stored in a battery and can be used by habitants. 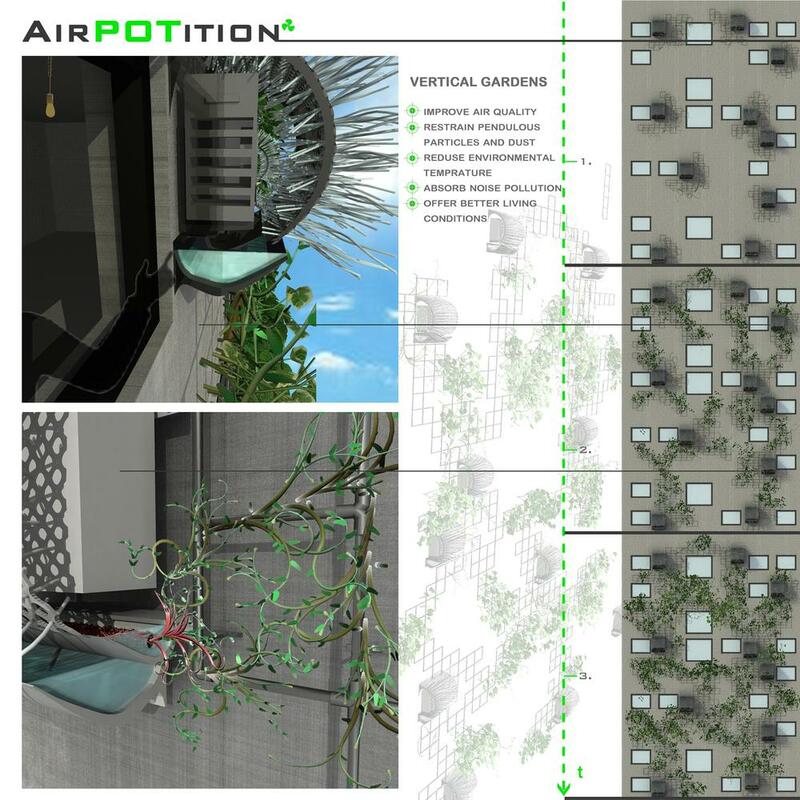 Moreover, an AirPOTition unit utilizes the useless water in order to grow vertical gardens in the city. This kind of plantation has a great impact on the city: it improves the air quality, restrains pendulous particles and dust, reduces environmental temperature, absorbs noise pollution and offers better living conditions.